CCTV video footage released by police shows a man grabbing a supermarket security guard by the throat. A murder investigation has been launched by police after a south London assault victim died. The father of a man stabbed to death in the street has made an impassioned plea for the killing to stop. A 16-year-old boy from Wallington, Sutton has been charged with attempted murder following an attack on a woman in her 40s. Shocked shoppers see man plunge to his death from height at Debenhams in Sutton. 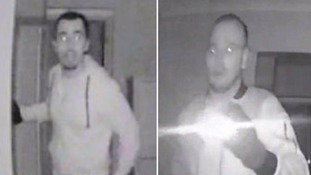 CCTV showing burglars scoping a home in south London for valuables has been released by police. Off duty paramedic Mel Armstrong, from Basildon, Essex ran to the rescue and saved the life of pensioner Brian Smith from Cheam in Sutton. Rattled officers ended up feeling slightly red-faced when they were involved in a tense stand-off with a snake - that turned out to be a garden ornament. The Metropolitan Police officers kept their distance from the two-foot long garden ornament fearing it was a dangerous reptile. It wasn't moving but they can stay still for a long time. We didn't want to move in too close in case we disturbed it. A resident in the flats in Sutton, south west London eventually confirmed it was just a garden ornament. Wayne John Lione leapt behind the wheel and drove at the parking officers who were sitting in their car nearby, in Sutton, south London. Paul Clement says he's had the perfect apprenticeship. Soon it will be time to graduate.